In this tutorial, I will show how to make a cube roll from side-to-side on a grid. This project took me around 3 days to complete, though much of that was wrapping my head around basic things in UE4. Some of the areas explored here include setting up key bindings and action mapping, setting and clearing timers, and rotating around an arbitrary point. First, you want to start by setting up the action mapping. What this does is basically binds an input button (like a keyboard key) to a particular action (really just a name that you make up). For this test I needed 4 keys for up, down, left and right. Since the arrow keys and WASD were already used by the default Unreal fly camera, I choose to employ the IJKL keys to move the cube around. These options are found in “Settings->Project Settings->Engine->Input->Bindings”. Next, we will need to connect those actions to a function in order to make something happen on the screen. You can do this by creating an “InputAction” Blueprint and choosing the name you created (like “Action_Up”). I set these actions to call a function I created for this example called “StartMoving”. 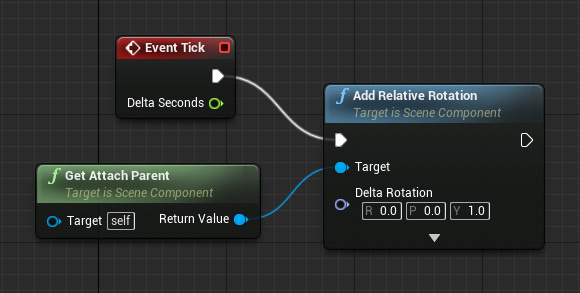 In some cases, you may want to bind the action to a custom event, which may simplify the code and allow for a cleaner Blueprint (as you can use events to effectively “jump” to other points in the same Blueprint without a line connecting them). In this case, I had to pass in some state (to know which direction the cube is moving) so using a function was better suited for the job. The “StartMoving” function is not that complex. 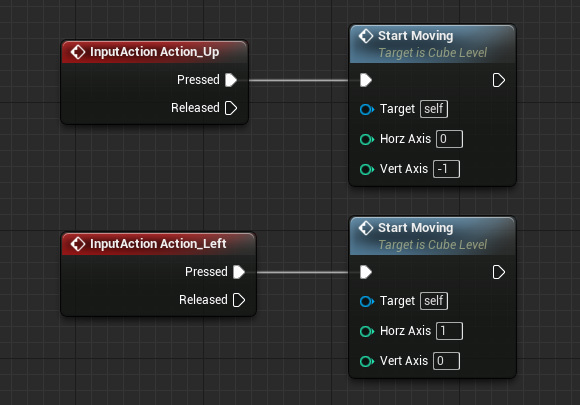 All it does it check first if the timer is active (to avoid registering input while the cube is already moving), save some state on the cube itself (the direction of movement and it’s last position), and then creates a timer to handle the animation. The key part is the creation of the timer itself, using “SetTimer”, which is shown below. You can think of a timer as spawning another process or thread that can run concurrently with your main logic. The timer just calls a function of your choice (“MoveTween” in this example), at a specified time interval (use 0.0166 for a 60Hz animation cycle, which looks smooth enough). You can also set whether it loops or not, we use looping in this case. 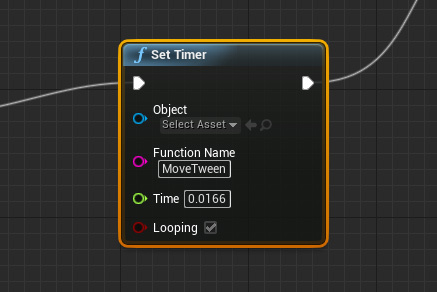 Finally, we have the “MoveTween” function, which is what is called by the timer and what does all the math calculation to rotate around a particular axis and point in space. It’s also what animates the cube, and clears the timer at the end itself. It’s very useful to be able to spawn a timer, and then have it terminate itself when necessary. The full function is shown below. Really, the core math of the method is done by two function included in UE4, “RotateVectorAroundAxis” and “RotatorFromAxisAngle”. We first create a axis based on the movement direction. Then we subtract the pivot point (in our case, the bottom edge of the cube), rotate around that axis, and then add the pivot point back to the location. The rotation around axis logic is actually based on an example shown on the Unreal Answer Hub, though it was modified to fit my purpose. Today I will show how to create a textured spinning cube using Unreal Engine 4. Making a cube spin is basically what I consider the “litmus test” of 3D engines. How long it takes you to figure this out will show how convenient or capable the engine is. While I might have skipped this test (by jumping straight into creating Pong) I thought it was worthwhile to go back and try it. Hopefully this tutorial will be helpful to some of you just getting started. First thing you should do is create a new blank project. I chose to make the project with the starter content (and deleting the furniture) however that won’t be important for this guide. Next look on the left-hand panel, make sure you are in place mode (the icon with the cube), and look under basic and find Cube. Now drag the cube into the scene. It will probably start inside the floor, so just press Q to go into move mode and then drag it up a little. Since looking at a gray model is not that exciting, lets add some texture. 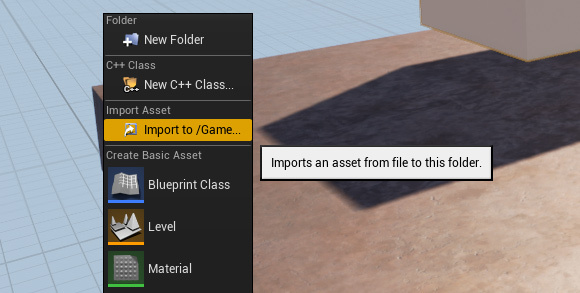 In the Content Browser on the bottom, right-click in the empty area and select “Import to /Game…”. Then find your image file and press Open. You should see the new texture appear in the browser. Now drag this texture onto the cube model. You’ll see this automatically create a default material for you. With the cube still selected, click “Movable” in the Details panel on the right. The next step is to create the component Blueprint. You can do this by clicking the green “+Add Component” button on the top of the Details panel. Choose “New Blueprint Script Component”. 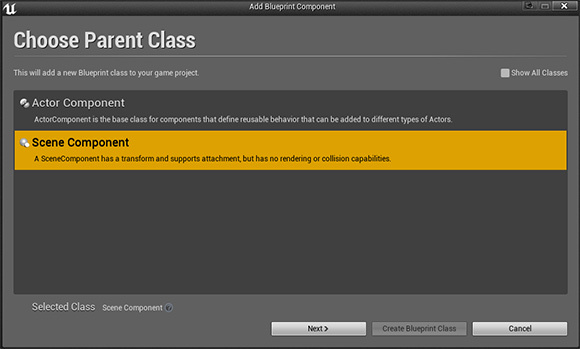 In the pop-up window, pick Scene Component, click Next, type a name in, then click “Create Blueprint Class”. In the new Blueprint window, you can delete the “Event Initialize Component” (though you can also leave it alone, won’t matter in this case). Pull off the output execution pin on “Event Tick” (it’s the white arrow looking thing on the upper-right). You should see a menu open. Start typing “rotation” and then pick “Add Relative Rotation”. In the Y field for “Delta Rotation” type in “1” and press Enter. Pull off the “Target” pin and type “parent” then click “Get Attach Parent”. Now you can save and compile the script. Switch back to the main editor window and press “Play”. That’s it! Hopefully this tutorial was useful to some people (please let me know in the comments). I plan to produce more of these in the future, and they should gradually get more complex as I get more familiar with the engine. It’s really quite amazing how quick and easy it is to work with Unreal. Using straight C++ and DirectX, one would be lucky to make a textured spinning cube in 2 hours, let alone 2 minutes. It really speaks to the robustness of the engine. Of course, I still have a long way to go in terms of learning the engine, so please follow me on this journey (and pray I don’t give up on this one). 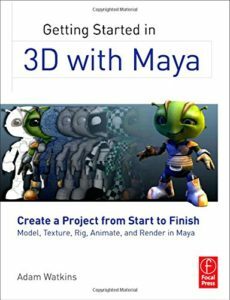 In what has to be one ridiculously long title for a pretty straight-forward book, Getting Started in 3D with Maya: Create a Project from Start to Finish – Model, Texture, Rig, Animate, and Render in Maya is actually not a bad place to start if you’re trying to get into 3D. 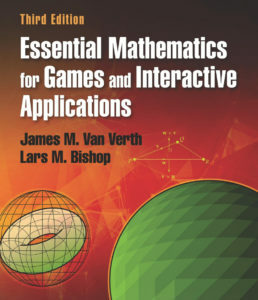 Adam Watkins manages to pack all the crucial steps of 3D modeling and animation into 9 concise chapters. I enjoyed the flow of the book, and felt that every important detail was explained. The author teaches just enough to get to the next step, and it’s all done in a logical order and progression. If you are just getting started with 3D, or if you know another package and are new to Maya, I think this is a excellent book to pick up. Watkins begins by explaining the general workflow and with the Maya philosophy (including a few somewhat comical hardware recommendations even though the book is only a couple years old). He continues with architectural modeling, organic modeling, UV layout, textures and materials, lighting and rendering, rigging and skinning, and finishes up with animation. Clocking in at around 448 pages, the book is not particularly short but I found I was able to get through it quickly. Each chapter was just the right size to read in one sitting, and the text was engaging enough to make me want to come back the following day. 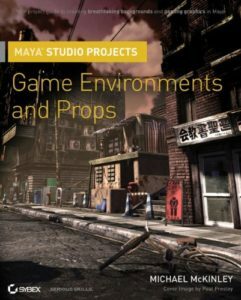 I definitely feel like I learned a thing or two by reading this book, and it has helped me to better understand the Maya workflow. Most 3D packages are huge, monolithic pieces of software, and no single book could cover everything. However, Getting Started in 3D with Maya covers the basic things you need to know in order to get started (so the book is true to it’s name). If I had one complaint, it’s that I thought the art direction could have been better. This book won’t teach you to be a masterful artist but I guess that wasn’t the goal or scope of the text. In any case, I would certainly be interested in reading more from the author as I feel he has a clear and honest style that is easy to learn from. Recommended. I found this book to be quite interesting, but it’s also very specific to the 3ds Max package. 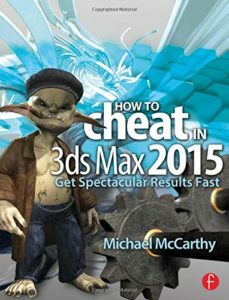 How to Cheat in 3ds Max 2015: Get Spectacular Results Fast by Michael McCarthy has about 15 chapters focusing on various aspects of the 3d modeling process. It probably only took me about a week to read the text, which I don’t mind at all. Not every book has to be a 1000 page tome. I actually find it refreshing to read short books, especially if the author can impart a deal of knowledge in a quick span of time. How to Cheat in 3ds Max 2015 was one of those books. 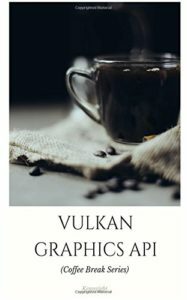 Included in the 328 page copy are some very essential topics in the creation of art in 3ds Max: customizing the UI, navigating the scene and transforming objects, basic modeling, character modeling, materials, lighting and shadows, reflections, animation, MAXScript, rendering, plug-ins, special effects, and more. 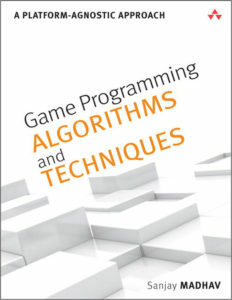 Not a bad amount of coverage, though many of the chapters are not extensive. If you’re using 3ds Max, I think this is a decent addition to your library. It covers some specific things well, and gives you enough information to know what to search for to find out more. I especially liked the chapter on how to make an object fracture and then fall into pieces using physics. It also shows you what tools there are (sometime even 3rd party plug-ins) and does give you a good idea of what’s possible if you’re new to Max. However, if you are using a different 3d package, the book may not be as useful. What I wish is that there were more general 3d art and modeling books out there. I’ve already read Digital Modeling by William Vaughan and it was amazing, but sort of a one-of-a-kind. Too many of the books out there seem to focus on one particular toolset and don’t try to abstract the concepts into something more widely applicable. Clearly, the basic foundation of modeling and texturing techniques are not all that different with different programs. The buttons or methods may be different, but the thought process is very similar. I can’t knock this book for that, though, it’s just more of a general musing on the subject. Overall I thought How to Cheat in 3ds Max 2015 was a competent book, and achieves what it set out to do. 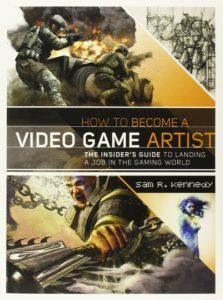 I feel like it would probably be useful for beginner 3d artists trying to up their game, but maybe as a 2nd or 3rd book. The chapters each have a sort of “cookbook” feel to them, so I think some other books do a better job of building on top of previous chapters in a more cohesive manner. However, I don’t think that was the goal here, so I won’t penalize the author. All in all: not bad.